Wow! We have been playing around offshore – out past 200 foot of water for over a week. I knew it would not keep going forever; but, our catch of beautiful Coho (Silver) Salmon and Steelhead (Ocean Run Rainbow Trout) was worth it. On Sunday the Salmon and Steelhead bite finally dried up offshore and we decided that we better head in where the Lake Trout are biting. Fortunately, on the way into shallower water this big King (Chinook) Salmon took a line running (yeah I know they only swim) for over three hundred feet. He peeled line off the reel like it was hooked in the prop. I was nearly convinced that we had foul hooked a King Salmon in the tail. He finally stopped running and our customer was able to reel in some line. Fifteen minutes later we landed this Big Monster – Hoping it was a Thirty Pounder – it weighed in at a respectable 28 pounds. Really nice Big King Salmon for an early July fish. This really Big King Salmon made the day for our Customers – R^2. 28 Pound King Salmon – They Will Be Getting Bigger! Hope to see you onboard for some great Charter Fishing Adventures. 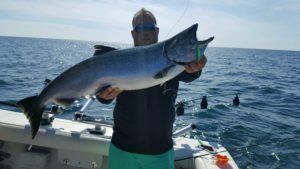 Over the last few days we have tried something new with our Lake Michigan Charter Fishing Adventures… Going offshore for silver fish – Coho Salmon, King Salmon (Chinook), and Steelhead (Ocean Run Rainbow Trout). Getting a lot of Coho Salmon and Steelhead bites. They have been a lot of fun. Steelhead have been jumping, twisting, and turning in great visuals behind Miryha. Unfortunately, with these Sportfish you lose as many as you catch. We have been coming in with some nice size Coho Salmon and Steelhead. Hopefully, this will last another week or two as we begin to see the King Salmon returning. We are expecting the King Salmon bite to be filled with some of the biggest Kings seen in the last decade. Give us a call to reserve a date and time for Miryha – we are filling up quickly. Tight Lines and Smooth Seas. Excellent fishing the last two weeks. This is the best King fishing we have had in years. 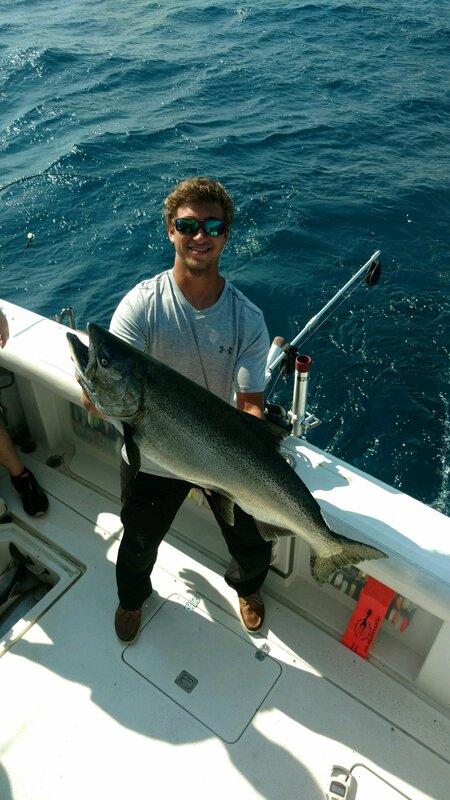 Here is a picture of First Mate Chandler with a 22 pound King Salmon. Great Week of Fishing Last Week! Wow! Capt Drew and Chandler had a very busy week Catching Lake Trout and Big King (Chinook) Salmon. Boy did they catch em!! I believe they averaged more than 10 fish per Lake Michigan Fishing Adventure out of Saugatuck. More importantly, they caught Big Fish. I remember hearing four or five times about catching 20 + pounders – King Salmon and Lake Trout. Really good job finding and catching some really Big Fish. This week the guys get one day off – and all they want to do is go fishing. Thursday (tomorrow) is an open day. If anyone wants to go and catch some Big Fish, give us a call or send us an email. Need to find the Boat? 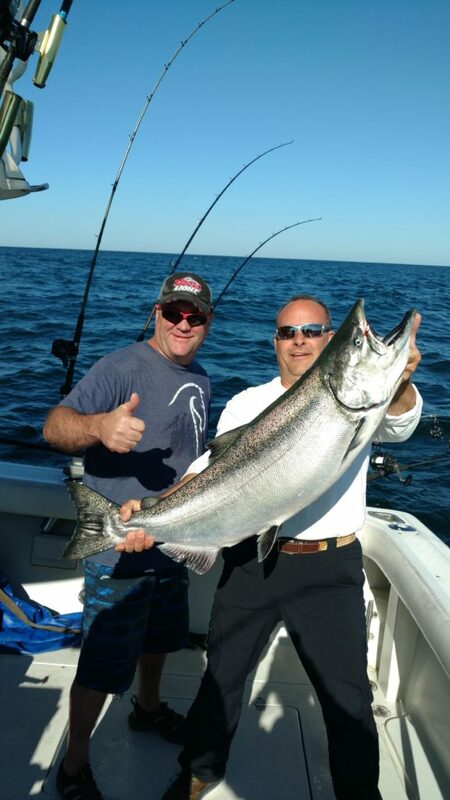 Join us for the best Saugatuck, Lake Michigan Sport and Charter Fishing!